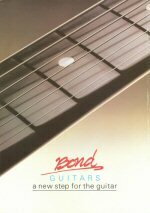 The Bond Electraglide was a very unusual, little-known guitar made in Scotland by Andrew Bond in 1984-5. The player selected pickups via five pushbuttons; volume, treble and bass were incremented numerically via digital rocker switches, confirmed by a three-colour LEDÂ readout. 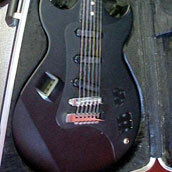 The guitar was launched at the 1984 NAMM show in America. Apart from the various gimmicks featured on the guitar, including the required use of an external power supply, it played normally and sounded normal, with three single-coil pickups and a normal body shape. The Electraglide was a big shock to the traditional guitar buying public, and was very unsuccessful, (even though I have personally nearly bought one a couple of times). British guitarist Mick Jones is known to have used a Bond Electraglide with his band Big Audio Dynamite in the mid 1980s. The Edge used his extensively on The Joshua Tree, including the solo on “One Tree Hill”, as well as on “Exit,” and “Mothers of the Disappeared”. Will Sargeant from Echo and The Bunnymen was also an Electraglide user.